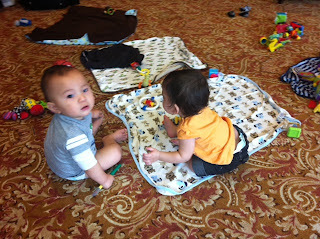 Today was our first Baby Basics get together. momstown Winnipeg moms with infants 0 to 12 months of age got together to do a keepsake craft and sit around and chat while the babies played, or in my sons case, attempted to break away from the group to go explore. 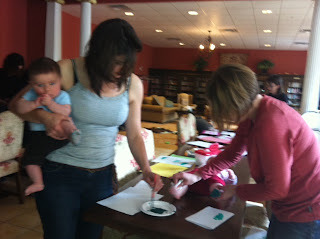 We brought out the washable, tempera paint and made some hand and foot prints. 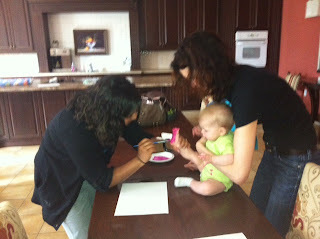 Was not an easy task with the squirmy babies, but we paired up and made some masterpieces! What is our Baby Basics Program? This program is designed for moms with babies aged 0-12 months looking to connect with other moms with infants. With a discussion theme led by an expert every other week, various topics related to parenting will be covered. Alternating weeks, momstown will lead you and your child in a short “Baby Picassos” art session and you and your baby will create a keepsake craft – it’s never too early to introduce creativity. 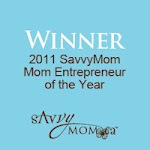 Each session also includes loads of chat time to get to know your local moms in momstown. So join us every week for some fun and interesting chats. 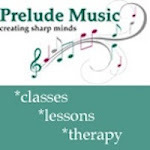 Just one more fabulous program that is included with your momstown membership! 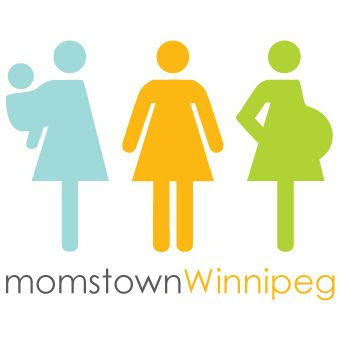 Register today at momstown Winnipeg.